After a full year away from #1, AAG recaptured the lead HMBS issuer slot for the first quarter of 2019, with $391 million of issuance for a 23.5% market share. RMF was second, with $323.5 million issued and 19.5% market share, and FAR remained in third with $244 million issued and 14.7% market share. Ocwen Loan Servicing and Nationstar round out the top five issuers. Ocwen issued $210.6 million for a 12.7% market share, and Nationstar was fifth with $142.7 million and 8.6% market share. These five issuers accounted for approximately 79% of all issuance, down from 2018’s record 92%. There were 15 active HMBS issuers during the quarter, including first-time issuer Synergy One Lending, now owned by Mutual of Omaha. 2019Q1 saw only $1.67 billion of HMBS issued, a 44% decline from one year ago, and an almost five-year quarterly low. For comparison, total HMBS issuance volume in the first quarter of 2018 equaled $2.97 billion. As previously noted, unless highly seasoned pool issuance makes a meaningful and lasting return, expect lower HMBS issuance volume going forward. New View Advisors compiled these rankings from publicly available Ginnie Mae data as well as private sources. HMBS float fell as predicted to less than $55 billion in February as payoffs continue to outweigh falling issuance. Once again with just over $900 million in payoffs, and a continued drought of new issuance, total outstanding HMBS ended the month at $54.8 billion, down over $225 million from January. HMBS float has been range-bound between just under $55 billion to $57 billion for over two years. Total HMBS float will likely fall further given current trends. As noted last week, HMBS issuance was only about $490 million in January, with no highly seasoned new issuance. Our friends at Recursion broke down the prepayment numbers further: the 98% MCA mandatory purchases accounted for $638 million, or about 71%, of the payoffs last month. This continues a gradual downward trend from the buyout peak in last year’s third quarter, which averaged over $750 million in Mandatory Purchases per month. February 2019: Groundhog Day for HMBS Market – Long Winter Ahead? HMBS issuance fell in February 2019 to just under $491 million, the lowest issuance level in nearly 5 years. February issuance was consistent with the sharply lower issuance trend of recent months, made even weaker due to February’s low day count and lack of any highly seasoned pools. 82 pools were issued in February, including nearly $274 million of new, first participation pools. HMBS float shrinkage will continue as February’s payoffs are almost certain to outweigh new issuance and interest roll-up. Reverse mortgage lenders face a new era of reduced volume, primarily due to the lower PLFs for Home Equity Conversion Mortgages (“HECMs”) in effect since the beginning of Fiscal Year 2018. For the entire year of 2018, HMBS issuance totaled about $9.6 billion, compared to $10.5 billion in 2017. The HMBS market will be hard pressed to equal last year’s totals, which included some HMBS issuance backed by new HECM loans originated at higher PLFs. Production of original new loan pools was about $274 million, down from $304 million in January and $277 million in December, and well below the $360 million issued in September 2018. Last month’s tail pool issuances totaled $217 million, within the range of recent tail issuance. By comparison, HMBS issuers sold 129 pools totaling $1.47 billion in February 2018. February 2019 issuance divided into 35 original pools and 47 tail pools. Original pools are those HMBS pools backed by first participations in previously uncertificated HECM loans. Tail HMBS issuances are HMBS pools consisting of subsequent participations. Tails are not from new loans, but they do represent new amounts lent. Tail HMBS issuance can generate profits for years, helping HMBS issuers during challenging times. Posted in HMBS | Comments Off on February 2019: Groundhog Day for HMBS Market – Long Winter Ahead? Structured Asset Securities Corporation Reverse Mortgage Loan Trust Series 2006-RM1 (“SASCO 2006-RM1”) recently became the fourth SASCO securitization trust of proprietary reverse mortgages to pay off completely. The remaining bondholders received their final payments on February 25, 2019; all bondholders received their principal and interest payments in full. The trust was created in August 2006 and was the fourth reverse mortgage securitization in U.S. history. The first two securitizations, SASCO 1999-RM1 and SASCO 2002-RM1, both paid off successfully in 2014. SASCO 2005-RM1 paid off in 2016. SASCO 2007-RM1 is the sole remaining transaction from Lehman Brothers’ SASCO “RM” securitization program. SASCO 2006-RM1 issued 4 bond classes: Class A1, A-IO, M1, and M2. These bonds, totaling $598 million, were secured by 1,558 adjustable rate Financial Freedom “Cash Account” loans. When SASCO 2005-RM1 paid off in 2016, we noted “Beginning in 2014, reverse mortgage lenders have revived proprietary reverse mortgages after a six year hiatus with very little new production.” Since then, production has ramped up as multiple lenders now originate proprietary reverse mortgages. New securitization programs have followed, supplied by both new and seasoned proprietary reverse mortgages. Reverse mortgage lenders are fast approaching the record of pre-crisis proprietary loan origination. Production peaked in 2007 at about $100 million per month, but ground to a halt with the mortgage crisis, crashing home prices, and the virtual destruction of the non-agency securitization market. The SASCO-RM securitization history has helped this revival by reinforcing the relative value story of proprietary reverse mortgages. If properly structured, proprietary reverse mortgage securities provide substantial credit protection with (like their HECM cousins) very stable prepayments. The credit story derives mainly from the low original Loan-to-Value (“LTV”) ratios of these loans, combined with conservative rating agency criteria. As was the case with all of the SASCO proprietary reverse securitizations, the rating agencies (in this case, Moody’s, S&P and Fitch) were right to insist that the triple-AAA Class A bonds be protected against a 30%+ decline in home prices — which was exactly the stress the trust successfully endured during the financial crisis. The transaction’s successful payoff continues a winning streak of nearly 20 years, including the darkest years of the mortgage crisis, in which no proprietary reverse mortgage bond has suffered a principal loss or write-down. As was the case with previous SASCO RM deals, the stability of the prepayments can be seen in many ways. For example, the paydown of the bonds validated the weighted average paydown speed predicted when the deal closed in 2006. For Class A1, the predicted weighted average life of 4.74 years at 100% of the Base Case Prepayment Curve (“100% PPC”) was spot on with the actual result. The Class A-IO paid all of its cash flow exactly to its schedule, tallying its projected weighted average life of 5.62 years. Class M1 was predicted to have a 3.71 year weighted average life; it clocked in at 3.79 years. Class M2 was predicted to have a 2.50 year weighted average life; it extended slightly to 3.66 years. HMBS issuance fell in January 2019 to just under $614 million, despite help from one highly seasoned pool of original collateral. January issuance was very similar to recent months’ weak numbers, which were among the lowest issuance levels in over four years. 97 pools were issued in January, including just over $300 million of new first participation pools. HMBS float shrinkage will continue as January’s prepayments are almost certain to outweigh new issuance and interest roll-up. Reverse mortgage lenders face a new era of reduced volume, primarily due to the new lower PLFs for Home Equity Conversion Mortgages (“HECMs”) in effect since the beginning of Fiscal Year 2018. For the entire year of 2018, HMBS issuance totaled about $9.6 billion, compared to $10.5 billion in 2017. The HMBS market will be hard pressed to equal last year’s totals, which also included HMBS issuance backed by new HECM loans originated at higher PLFs. Production of original new loan pools was about $304 million, up from last month’s $277 million, and November’s $298 million, but below October’s $325 million and $360 million in September. Last month’s tail pool issuances totaled $259 million, within the range of recent tail issuance. By comparison, HMBS issuers sold 111 pools totaling $869 million in January 2018. 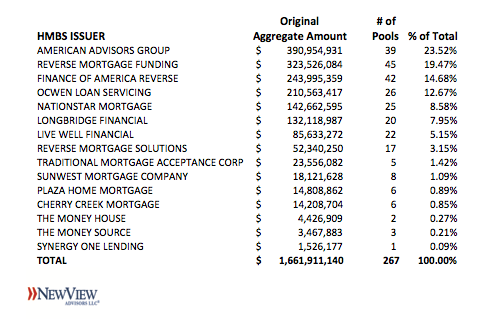 January 2019 issuance divided into 36 original pools and 61 tail pools. Original pools are those HMBS pools backed by first participations in previously uncertificated HECM loans. Tail HMBS issuances are HMBS pools consisting of subsequent participations. Tails are not from new loans, but they do represent new amounts lent. Tail HMBS issuance can generate profits for years, helping HMBS issuers during challenging times. HMBS float fell again in December as big payoffs continued to outweigh falling issuance. With just over $900 million in payoffs, total outstanding HMBS ended the month at $55.1 billion, down from about $55.3 billion at the end of November. HMBS float has been range-bound between just under $55 billion to $57 billion for over two years. Fixed Rate HMBS, which once reigned as King of all HMBS Product Types, has shrunk to just over $13 billion in outstanding float, down from $19.1 billion at year-end 2017 and $24.8 billion at the end of 2016. Barely $1 billion in fixed rate HMBS was issued in 2018. This is the result of HECM program changes that severely restricted the full Principal Limit initial borrowing, the staple of fixed rate HECM. As noted last week, HMBS issuance was only about $619 million in December, including a few highly seasoned new issues. We predict continuing declines in Mandatory Buyouts in the foreseeable future. “Peak Buyout” was an echo of the issuance from 2009 through the first half of 2013. Much of this production has now been repurchased or repaid by borrowers. Although many loans continue to reach their buyout threshold equal to 98% of their Maximum Claim Amount (“MCA”), Peak Buyout appears to have ended. Going forward, billion-dollar-plus payoff months will be the exception rather than the rule. Our friends at Recursion broke down the prepayment numbers further: the 98% MCA mandatory purchases accounted for $625 million, or about 68%, of the payoffs last month. This is down $40 million from November, and continues a generally downward trend from the third quarter, which averaged over $750 million in Mandatory Purchases per month.